Making use of the latest development technologies, Progressive Web Apps utilise the best of the web and mobile apps to provide a flexible and highly functional user experience. Utilising this Progressive Web Apps technology, our specialist developers can delivery highly functional browser based Apps for your business. In basic terms, Progressive Web Apps are web pages that look and behave like an App. This makes them faster to develop and easier to maintain; and because they are only reliant upon browser technologies they are highly versatile and scalable. Just like phone apps, these Progressive Web Apps can be attractive, incredibly functional and responsive, regardless of device or even browser choice. They can utilise native phone functions like taking a photograph or push notifications, and they can even work offline. 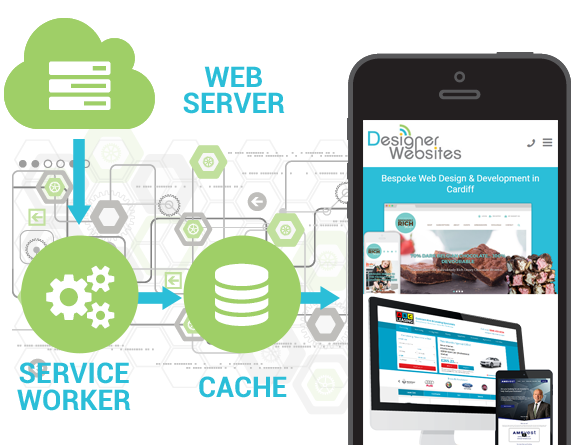 They can easily be integrated with your website, database and even other applications. These features are what make Progressive Web Apps so powerful. One of the significant advantages of Progressive Web Apps is that your users do not need to log onto the App Store to install the App. They can simply connect to the internet for first time download and use, and then use it wherever they are, whether they are online or offline. AdaptableThrough the use of Service Workers which power things like offline functionality, background updating, push notifications our developers are able to create Apps which work on low-quality networks, or even offline. We can take advantage of device features, in a progressive manner. Like phone Apps, a Progressive Web App can be installed on the devices home screen, with a suitable shortcut icon. ResponsiveProgressive Web Apps are responsive in terms of perfectly fitting the screen size of any device, but also in respect of their ability to provide very quick and streamline interaction with the user. By using a technology called an Application Shell, we can make the App behave like a native phone App. Also, when new content or updates are published, the Progressive Web App is automatically updated as soon as the user is connected to the Internet. DiscoverableAs Progressive Web Apps have URLs like a normal website they are more shareable than a phone App. Also, they are accessible to anyone and everyone from anywhere on any device, meaning fewer obstacles between you and your consumer. Most importantly, because Progressive Web Apps are essentially a website, it makes them indexable by the search engines, meaning that your App can be found via a simple search, and even optimised appropriately for keywords. If you would like to find out more about how we can create a high functional and attractive Progressive Web App for your business, just give us a call on 01446 339050. If you’ve made up your mind, you can request a quote here.